Being able to play an unaccompanied solo piece is a requirement of the RGT Grade Five acoustic guitar exams. In the exam you can perform a ‘free choice’ piece (self-composed or otherwise), or one taken from the list of pieces listed on the RGT Acoustic Guitar Exam Page, or you can choose from the selection of pieces provided in the RGT Acoustic Guitar Grade Five Handbook. In any case you should study the pieces in the handbook as they provide you with a clear example of the standard of the piece you need to play at Grade Five level. An extract of the notation for the first part of one of the pieces from the RGT Grade Five handbook, ‘Country Mood,’ is provided below and is demonstrated in the video found in this lesson as well. It is a ‘flatpicking’ piece – designed to be played with a plectrum. The piece needs to be played fairly quickly in order capture the style. The extract below, the final example, is from the introduction section of the piece. It you look at the first two bars of the notation it seems that all the notes are the same, but if you look at the Tab you’ll see that it utilises a ‘cross-string picking’ technique – alternating between playing the open G string and the same G note fretted on the fourth string. I’ve provided a short exercise, the first example, to help you practice that technique. The next two bars of the extract include hammer-on techniques and I’ve provided another short exercise, the second example, to help you perfect that technique. 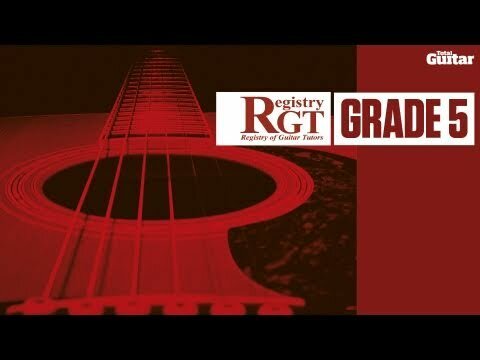 You can also click here to purchase the RGT Grade 5 Acoustic Guitar Exam Book, which contains the full score to ‘Country Mood,’ as well as all of the other musical requirements for this exam. Here is the tab for the first exercise in the video below, to help get you started with this exercise in the practice room, here is a quick tip to keep in mind when practicing this exercise. Here is the tab for the second exercise in the video below, to help get you started with this exercise in the practice room, here is a quick tip to keep in mind when practicing this exercise. To finish up, here is the tab/notation for the introduction to ‘Country Mood’ that you can now work through using the techniques learned in the previous exercises. To find out more about the ‘Country Mood,’ and the RGT Acoustic Guitar Grade 5 Exam, please download the RGT Acoustic Guitar Exam Information Booklet. 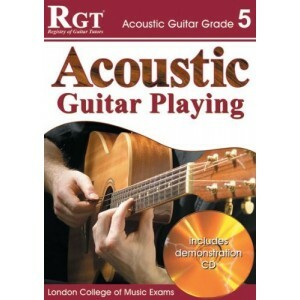 You can also check out the RGT Acoustic Guitar Grade 5 Book, which comes with a CD and contains notation and recordings of all the exam pieces, as well as diagrams for all of the chords and scales that the pieces are based on. This entry was posted in Acoustic Guitar Video Lessons and tagged RGT Acoustic Guitar Grade 5 by Alan. Bookmark the permalink.